Schlock-Wire: Take A Voyage To LAKE PLACID On Blu-Ray With Scream Factory In July – Schlockmania! Featuring All-New Interviews with Actor Bill Pullman, Filmmaker Steve Miner and More! Pre-Order This Highly Anticipated SCREAM FACTORY Home Entertainment Release Today! You’ll never know what bit you… It has existed prehistoric times and was worshipped by ancient cultures. It can kill a man with one crushing bite! This summer, one of the world’s oldest creatures has found a new home. Written by David E. Kelley (Ally Mcbeal, Boston Legal) and directed by Steve Miner (Halloween H20, Friday The 13th Part 2), LAKE PLACID stars Bill Pullman(Independence Day, The Grudge), Bridget Fonda (Jackie Brown, Point of No Return), Oliver Platt (X-Men: First Class, TV’s Fargo) and Brendan Gleeson (Troy, The Village). Brimming with heart-racing suspense and thrills, this bloody terrifying tale of man vs. nature and survival also co-stars Betty White (The Golden Girls) as the cantankerous Mrs. Bickerman. On July 8, 2014, SCREAM FACTORY™ will unleash LAKE PLACID COLLECTOR’S EDITION Blu-ray™, featuring insightful bonus content and all-new interviews with director Steve Miner, actor Bill Pullman, production designer John Willett and more. This definitive home entertainment release also contains a collectible cover featuring newly rendered artwork, a reversible cover wrap with original theatrical key art. 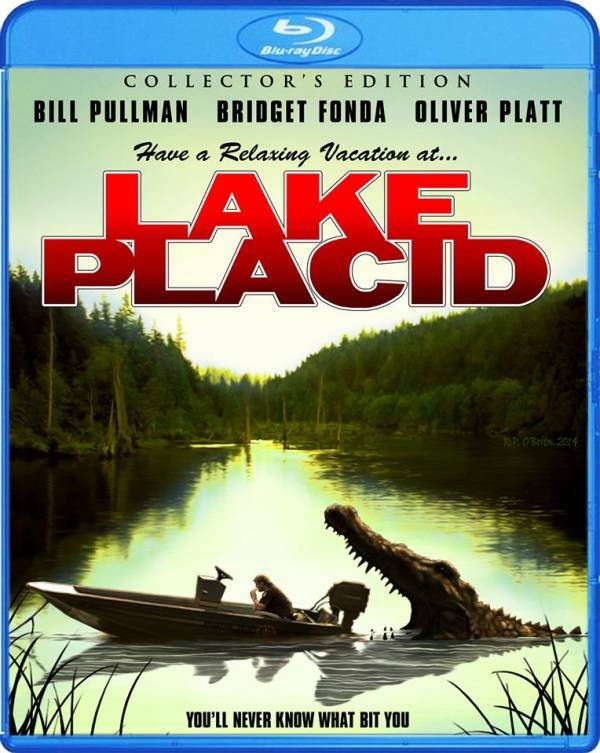 A must-have for loyal fans, movie collectors and horror enthusiasts to complete their entertainment library, LAKE PLACID COLLECTOR’S EDITION Blu-ray is priced to own at $29.93 SRP. A tranquil New England lakefront erupts into an action-packed den of destruction. An investigative team, armed with state-of-the-art equipment, high powered weaponry and a biting sense of sarcasm, must work together to defeat Black Lake’s most ferocious resident: a prehistoric crocodile! Written by David E. Kelley, directed by Steve Miner, and co-starring Betty White as the cantankerous Mrs. Bickerman, this terrifying tale of survival “combines humor and thrills with remarkable deftness” (New York Post). – The Making of LAKE PLACID featuring new interviews with director Steve Miner, actor Bill Pullman, director of photography Daryn Okada, editor Marshall Harvey, Production Designer John Willett, Effects supervisor Nick Marra and Puppeteer Toby Lindala. – Vintage Featurette featuring interviews with actors Bridget Fonda, Bill Pullman, Oliver Platt, Brendon Gleason, Bette White and director Steve Miner. Special Features Are Not Rated. Shout! Factory will continue to present the on-going SCREAM FACTORY™ home entertainment series in 2014 with specific release dates, extras and key art. Meanwhile, fans are encouraged to visit the Scream Factory main website (www.screamfactorydvd.com), follow them on Facebook (www.facebook.com/ScreamFactoryDVD) and Twitter (www.Twitter.com/@Scream_Factory) or to view exclusive video content on YouTube (http://www.youtube.com/user/ScreamFactoryTV/Home).